I’ve put this latest write up about injection framework I’ve put together into Hadoop. This page will be getting more details about Hadoop development and testing using AspectJ based Injection Framework. The idea of code injection is fairly simple: it is an infusion of new or modification of existing behavior into a code of a software application. Fault Injection, which will be discussed later, is a similar mechanism for adding errors and exceptions into an application’s logic to achieve a higher coverage and fault tolerance of the system. Different implementations of this idea are available today. Hadoop’s inject framework is built on top of Aspect Oriented Paradigm (AOP) implemented on top of AspectJ toolkit. I’ve started working on Hadoop at Yahoo! Great place and very interesting software project. By the way, we are hiring big time! Speak Java concurrently? Can explain how locking on object is different from class’ locking? Looking for great place to work? Leave me a comment here w/ your email and I’ll get back to you in no time. 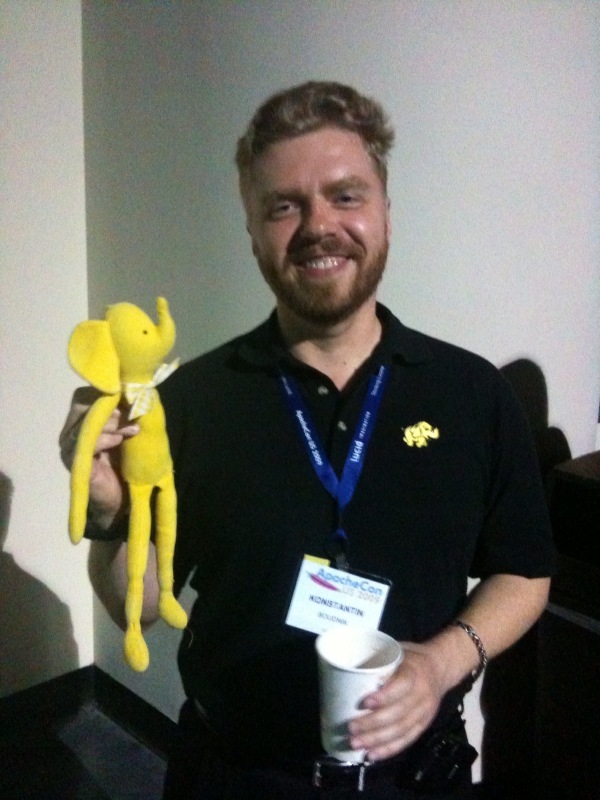 That said, I’ve went to ApacheCon’09 last night (10 years anniversary of Apache Foundation) and happen to a group picture with The elephant – the actual Hadoop 🙂 – feels me with pride.